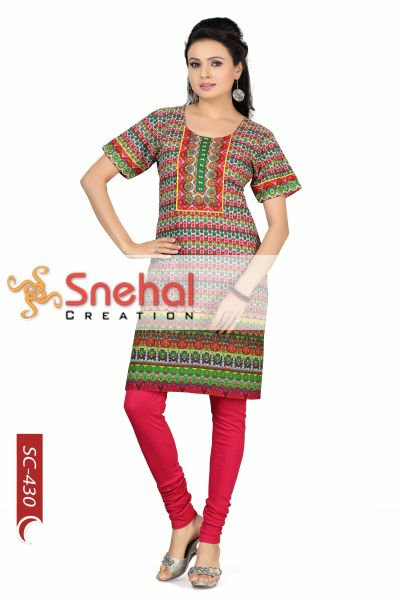 Set the mood of the day to another level altogether when you wear this harlequin cotton tunic designed to wearable perfection by Snehal Creations. The main fabric of the tunic is an intricate multi coloured print that runs in horizontal patterns throughout the tunic. The round neck is supported by a distinct neck panel with different printed design and some buttons to match. The short sleeves and easy to wear cotton fabric make it a summer essential for every modern girl. Grab it now! AVAILABLE IN 4 DIFFERENT COLORS.